Did you know? Sixty-five percent of officers handle unidentified substances or containers of unknown substances while on the job, either to test in the field or to package and send to crime labs. And more than 90 percent of officers are worried about exposure to fentanyl and its analogues. That’s according to a recent PoliceOne survey of more than 300 officers. Another alarming statistic: nearly 20 percent of respondents said that their agency is called to overdose cases at least daily and sometimes on every shift. Gaining ground on the growing opioid crisis in your community requires a combined approach of following the right precautions and improving your testing and identification strategies. Here are three ways that you can improve opioid detection and testing in the field – and keep your first responders safe from life-threatening accidental exposure. Detecting trace levels of unseen fentanyl, or other substances, on door handles, steering wheels, hands, or hard-to-access surfaces is a critical first step in protection against exposure. Trace detectors, commonly used in airports around the world, can analyze a swab wiped on surfaces that may have been in contact with an illicit substance such as morphine; buprenorphine/suboxone; cocaine; heroin; or fentanyl analogues. The best of these tools offer trace detection for multiple fentanyl analogues and are able to detect as little as 10-100 ng of fentanyl. These devices are lightweight, flexible and cost effective, and they can alert your officers to unseen threats within seconds. Collecting and sending a suspected threat off-site to a forensic laboratory for analysis is often not an option when health and safety is at risk. 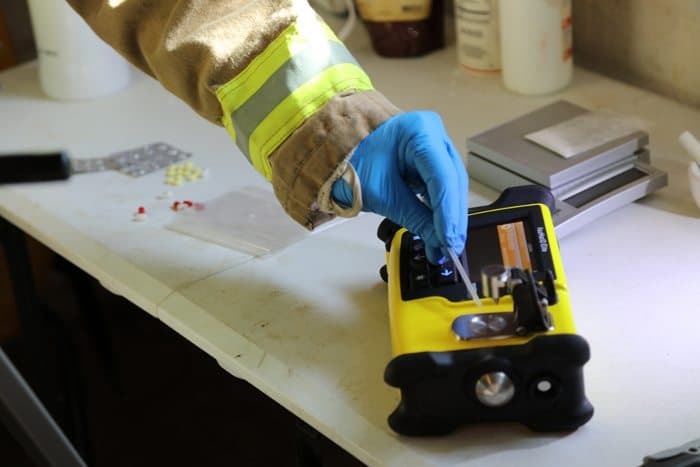 Using handheld chemical identification technology called Fourier Transform Infrared (FTIR) spectroscopy, officers can test bulk powders, gels and liquids to obtain the information needed on-scene, in 30 seconds or less. This type of device is good for a variety of scenarios, including, for example, traffic stops or temporary checkpoints. With the right technology, results can be used as court admissible evidence. There are also times when officers need to be able to analyze suspected fentanyl without opening the container or packaging in which it sits. For instances where officers need to test unknown substances through translucent and semi-translucent containers such as plastic and glass, miniaturized identifiers are available that use a laser for analysis. Not only do these devices enable analysis to be done without having to touch or disturb a sample, they are also robust; compact; accurate; and fast. They can also be used in tough conditions and high temperatures, and can detect over 500 substances, including fentanyl, without having to touch them – making them an ideal tool to increase safety and improve decision making in the field. With fentanyl deaths up 540% in three years, the opioid crisis isn’t just harming our citizens, it is putting our first responders at risk every day. Safeguard your teams with proven laboratory technology for use in the field. For more information on today’s affordable, easy-to-use detection and identification devices available from Smits Detection, check out our section Explosives & Narcotics trace detection.